This is a Wealth-Lab static and fundamental provider for free daily data from Tiingo.com. The feed makes available the historical data for 60,000+ global securities (including U.S. and Chinese (Shanghai/Shenzhen exchanges) stocks, mutual funds and ETFs), fundamental data (free users: 5 years, 2000 top stocks; 12+ years for 19,000+ stocks for Power users; see their pricing). Split and dividend history is stored locally and can be optionally applied to price data. This means that DataSet refreshes are never required in order to apply the most-recent split and dividend data. Chart Annotations: "Split (Tiingo)" and "Dividend (Tiingo)". Automatic data corrections for data changed on the Tiingo server (usually affects volume). Starting from version 2018.03 the provider no longer accepts username and password as this basic authentication proved to be unreliable. Never perform On Demand data updates: Overrides Wealth-Lab's On demand update option so that backtests in the Strategy Window/Monitor always run quickly with cached data. Perform Dividend/Split Adjustment: Data are adjusted at the moment they're passed to Wealth-Lab by the Tiingo provider so that the newest dividends are applied automatically to the price data. Note that split and dividend adjustments affect both price and volume. The dividend adjustment factor equation is 1 - dividend/close. Prices (pre-ex-date) are multiplied by the adjustment factor(s), whereas the factor becomes the divisor for volume. Adjustment mode when Data Range specified: Choose "Keep" so that price and volume data are always the same, historically, even when specifying a past data range. "Ignore" is an advanced option for testing with past adjusted data without the influence of future splits or dividends that are excluded from the chart's Date Range. To use the right-click bar data editor for anything besides deleting a bar in a Tiingo chart, you must apply the "Keep" option during the edit. See Data Editing below. The Tiingo Fundamental Provider always returns split-adjusted dividends for a chart's dividend popup as well as when accessing the "Dividend (Tiingo)" fundamental item in Strategy code. While the dividend adjustment factor maintains proper percentage relationships between prices, it's possible that new dividends affect previous backtest results (trades) for some strategies. Disable "Apply dividends" in the Backtest Settings Preferences when using dividend-adjusted data for backtesting. If you don't, the dividend effect could be duplicated in the Performance results, especially for the Buy & Hold Strategy. right-click the bar and select Edit Bar Data. 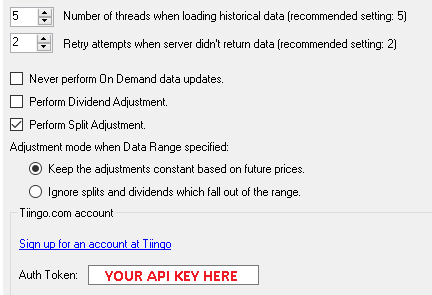 When editing Tiingo data, be aware of the Perform Dividend Adjustment selection since the chart values will reflect this adjustment. Deselect this option and refresh the chart to edit raw price and volume. With the "Ignore splits and dividends which fall out of the range" option selected (disabled by default), only deleting bars is possible. Be patient as initial historical data backfill will take quite a time from Tiingo's server to satisfy your requests. However, daily updates are as fast as with any other data provider. In rare case you'd need to reload the fundamental items, you have to delete the TiingoFundamentalProvider folder. There are usage limitations imposed by Tiingo on both the free and paid ("Power") users. Free users can get requests the data for nor more than 500 symbols in a month and are also limited in monthly bandwidth and requests per hour more appreciably than Power users are. See this page for more information.